Hamish and Hermione Hole need a new home, but wherever they go, they cause chaos. Will the two holes ever find a place where they are appreciated? 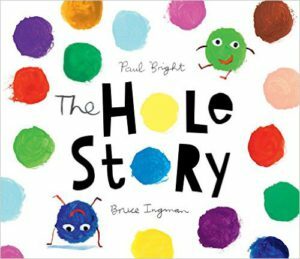 Discover the secret life of holes! 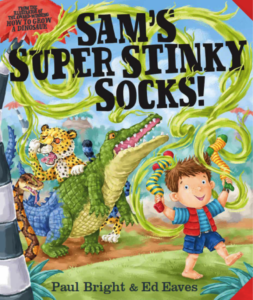 Sam’s Dad gives him some wise advice when he sets off to see the world – pretend to have a cold to avoid a snake, glue a crocodile’s jaws with bubble gum and always, ALWAYS wash your socks. Will Sam listen, though? 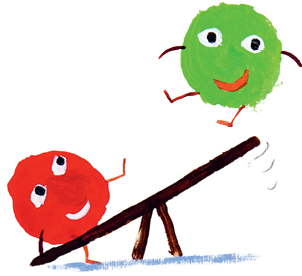 Another rhyming story with brilliant illustrations by Ed Eaves. The star of the story is his goggle-eyed and terrifyingly-toothy Jumbo-Bumbo-Fly! Meg Mummisaurus has laid an egg! But how can she keep it safe from a wagging Wagosaurus, a stomping Clomposaurus and a bumbling, stumbling Dozysaurus? Come back Meg! Protect your egg! Look out, look out, look out! Over the hill stomps a huge, hungry Snorklum, who thinks he might have a Mole sandwich for tea with a little salt and pepper and chunky pickle. 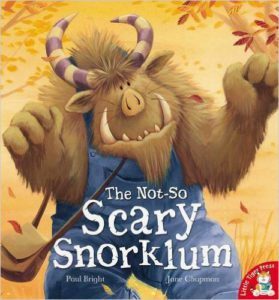 But the Snorklum is scared of something too. Why do his knees knock, his tail twitch, and his whiskers wibble in a worried sort of way? And why is he in such a hurry? 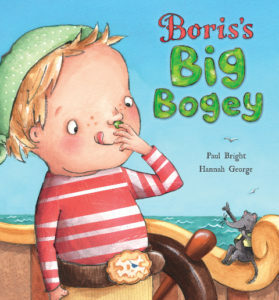 This is probably the only story in the whole world about pirates and bogeys. What happens when Boris flicks a bogey onto the pirate map? And what can Boris do when the pirate ship starts to sink? This is a yucky story for mucky kids. Just make sure you wash your hands after reading it! 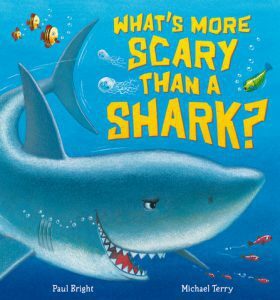 What’s More Scary than a Shark? 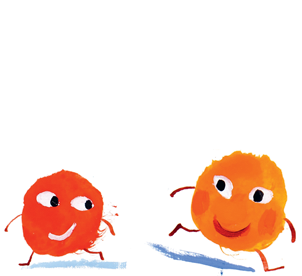 This was another chance to work with the wonderful illustrator Michael Terry. I thought a shark story would suit his colourful style, so I tried various scary, sharky stories, and this one worked out the best. Scary Shark falls in love with Sadie Shark. The lobster tells him that ladies like presents, but Scary Shark’s presents don’t work out as he had hoped. He keeps trying, and finds out that lady sharks can be pretty scary too! Do you have a brother or sister who’s sometimes a bit of a pest? Ty Tyrannosaurus certainly does. Every time he is creeping up on his dinosaur prey, his little sister Teri gets in the way. Ty gets more and more angry and more and more hungry. But he’s not the only hungry dinosaur around. 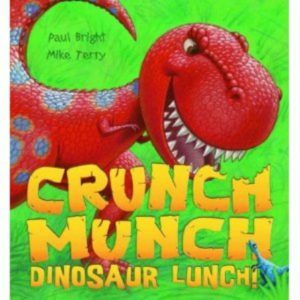 Crunch Munch Dinosaur Lunch! 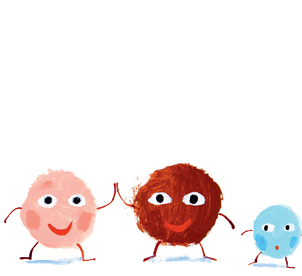 was shortlisted for the 2010 Red House Children’s Book Award. When Charlie puts on his special underpants and pulls them up tight, he becomes a real superhero. But one windy day when his underpants are drying on the washing line, all of the washing gets blown up into the air and far, far away. 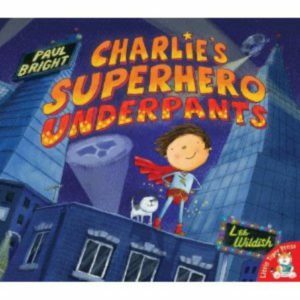 Charlie goes travelling around the world to find his superhero pants. He finds lots of animals wearing other items of the family’s clothing, but will he ever find his superhero underpants? 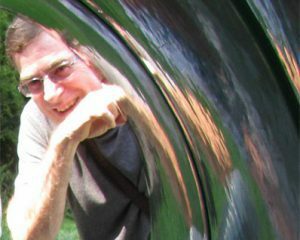 Illustrations by Lee Wildish, including a wonderful full-page picture of a very special creature. 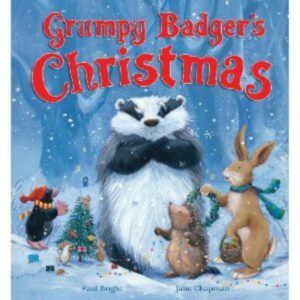 I wrote this story when the people at Little Tiger Press said there was a chance to work with Jane Chapman, who does wonderful animal illustrations. 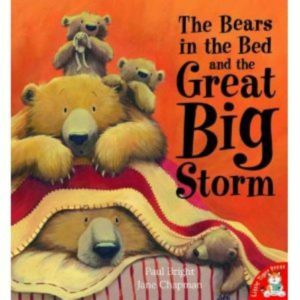 I tried various stories about bears – bears up a tree, bears eating honey, and gradually decided on bears in a storm. The younger bears are scared of the storm and think they can hear monsters outside. They all crawl into bed with Bear, who reassures them that ‘There’s no such thing as monsters!’. But when there’s a knock at the door, Bear isn’t so sure. 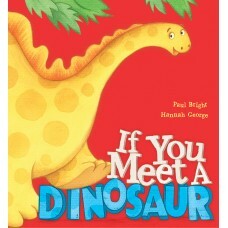 This book is also available with a CD featuring narration by Justin Fletcher (CBeebie’s Mr Tumble) and Sophie Thompson.